The post-Independent political history of the country has shown that major political parties experience ups and downs in their existence. The United National Party, founded by D.S. Senanayake in 1946, had governed the country for over 30 years under seven leaders in different terms of office. The party was defeated by SLFP-led coalitions on four occasions since Independence, but it never remained in the Opposition for more than one parliamentary term prior to 1994. 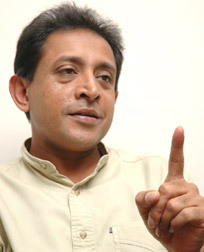 Since 1994, the performance of this grand old party at every successive election had been deplorable under the incumbent leadership of Ranil Wickremesinghe and a group headed by young Parliamentarian Sajith Premadasa agitated for some reforms in the party mechanism including some amendments in the party constitution to avoid further defeats and restore the lost glory of the party. Reforms were effected sometime back, but no significant improvement was made even at subsequent elections. Then the United Bhikkhu Front came forward to assist the party in its reorganisational activities and reunite its disintegrated factions. Leader Ranil Wickremesinghe accepted the suggestions submitted by the Bhikkhu Front and a Leadership Council was formed to handle the party affairs. Accordingly, Chairman of the party Gamini Jayawickreme Perera stepped down, paving the way for an eligible person to take over the position. One of the most respected Muslim gentlemen of the House, senior Parliamentarian from Kegalle district Kabir Hashim was appointed as the new Chairman of the UNP by its leader with the consensus of the Working Committee. Q: Your party hierarchy has reposed confidence in you by appointing you as the Chairman of the party following the resignation of Gamini Jayawickrema Perera. How do you hope to meet this challenge and restore the lost glory of your party? A: I have been appointed as Chairman at a challenging moment of time and I realise the degree of confidence placed on me by the party and at the same time I realise my responsibility. I hope to play a mediatory role and to try and bring most of the divided factions together. Unity is key to victory and I will work on this. On the other hand, I want to help get the party grass roots organised and to groom the party for victory this year at a national election. Q: You are a member of the Leadership Council (LC) which was formed to drive the party to victory at a future election. What is the degree of progress being made by the LC to achieve its ends? A: The LC is already engaged in appointing organisers for 2014, appoint a Nomination Board for the Western and Southern Provincial Councils and choose candidates. The LC has designed the Jana Jaya work program to resuscitate the grass roots organisers of the party. In addition, it has brought about unity and certain factions within our party have come together. Of course, there are still loose ends which need tying up and we have a few more challenges which we wish to overcome. Q: To the average voter, the UNP appears to be disintegrating, with the loss of the one time strong vote bank. Are you optimistic that the Leadership Council will be able to catch up and consolidate its gains in the future? A: The UNP vote base is still intact. There is a lack of confidence on the part of UNP activists and voters about the party's ability to win elections. There has to be confidence building and a strong organisational strategy. We believe that we have a good plan with Jana Jaya and our overall political strategy. The LC can do it. Q: Your party was virtually divided into two groups such as Ranil's group and Sajith's group after the continuous defeats suffered by the party at the last few elections. Have you sorted out the internal conflicts after the formation of the Leadership Council? A: We have begun the process of reconciliation. It is a hard road to peace and unity, but we shall prevail. We are motivating our party cadre to think as one and not as different groups. We are UNPers first. That is the message we are spreading and it is working slowly but surely. Q: Provincial Council elections for the Western and Southern provinces are round the corner. How are your party's preparations for the same? Do you think that you could emerge victorious in either province? A: We are ready. The nominations are complete and the party is working hard. The Government staggers elections because they do not have the guts to have elections in one go as that way, the Opposition will be more strong. When you stagger elections, as the Opposition we find more pressure on our limited resources while the Government uses State resources unfairly. Q: You are the most senior UNP member in the Kegalle district and it is the general belief that at the next general election, you would be a National List nominee. Do you hope to field another Muslim candidate from the Kegalle district as there is a Muslim voter population of well over 30,000? A: Who gave you this idea about me being on the National List? I have always fought my way into Parliament from one of the most difficult districts where there is a very small Muslim population. I have won the confidence of the majority Buddhist community. I am going to contest next time too, unless the Party does not want to give me nomination and decides to send me home. politics? What is its impact on the national fabric? A: Every citizen has an equal right to come forward as a political candidate. It is not fair to disqualify someone just because he/she is a film star or singer. It is another recognised profession. The point is the party fielding such persons must look at the character and qualifications of such people and see if these candidates have the capability of serving the people who vote for them. In the case of nominating drug lords or swindlers, the question does not apply to our Party. Q: Politicians of all hues field their kith and kin at PC elections in the hope of accessing the national Legislature eventually. Are these political build ups' a threat to democracy and political transparency? A: Yes. Family entrants must be considered only on an exceptional basis rather than the rule as it is applied today. There must be an opportunity for others to serve their people rather than a few selected families who more or less serve themselves. Q: The 13th Amendment has become the bone of contention in the devolution of land and police powers. In the face of radicalised TNA politics at this juncture, don't you think their powers are detrimental to the country's territorial integrity? A: Wasn't it a government decision to hold the Northern Provincial Elections?. Surely, they must have made an assessment of the security threats on a hostile provincial council. If they have not done their homework, they do not deserve to be a government. Q: Forces hostile to Sri Lanka will have their day at the March UNHRC sessions. What is the UNP's stand towards European democracy's attempts at moving country-specific resolutions? A: The Government has given a signed undertaking under the LLRC report and has agreed to fulfil certain things. The people of this country should question the Government and ask them what they have promised the international community. The Government says one thing in Sinhala and another thing in English. As for the UNP, it will never compromise the Sovereignty of our Nation to any forces. We won Independence for this country and we shall not let anyone take it back!